The second largest city in Sweden, it is an ice-free port on the North Sea with negligible tides. There are many suitable locations for ports on the islands of this coast and there were several precursors to the current city of Gothenburg which were razed to the ground by Danish invaders. The present city was established in the 17th century under Gustavus Adolphus and, because it gave Sweden access to the North Sea, soon became commercially important. 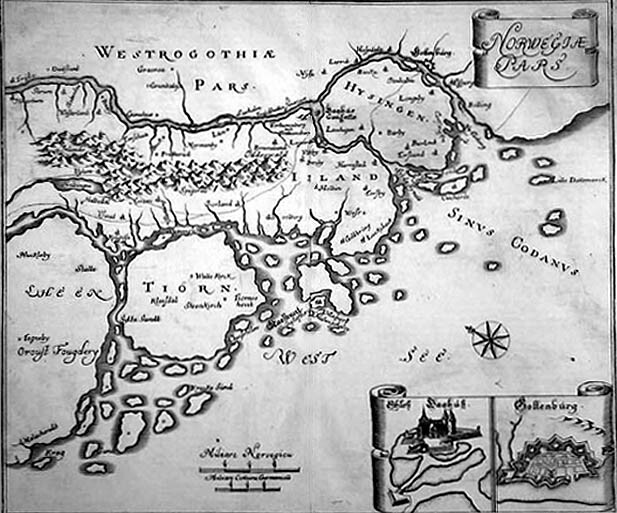 The Marquis of Montrose came here late in 1649 staying with a Scottish merchant by the name of Makeleer (originally Maclean) and spent three months negotiating the purchase of warships and weaponry from the Swedish crown. It was during his time here, also, that he wrote his Letter to the Scottish People. In early January 1650, weapons were delivered to him from the armouries of Kalmar and Stockholm and he waited off Gothenburg for orders from Charles II. When these did not come, he travelled by land to Bergen where the fleet of a warship and two merchantmen joined him. They sailed from Bergen in mid-March, for the Orkney Islands and here, at last, he received orders for the invasion from Charles. By May he had been defeated at the Battle of Carbisdale, betrayed by Charles II who disavowed him under the terms of the Treaty of Breda and betrayed again, this time to the Covenanters, by Neil MacLeod, laird of Assynt who had offered him protection. Montrose was hanged in Edinburgh on 21 May 1650. Search for voyages to Gothenburg in the 17th century.